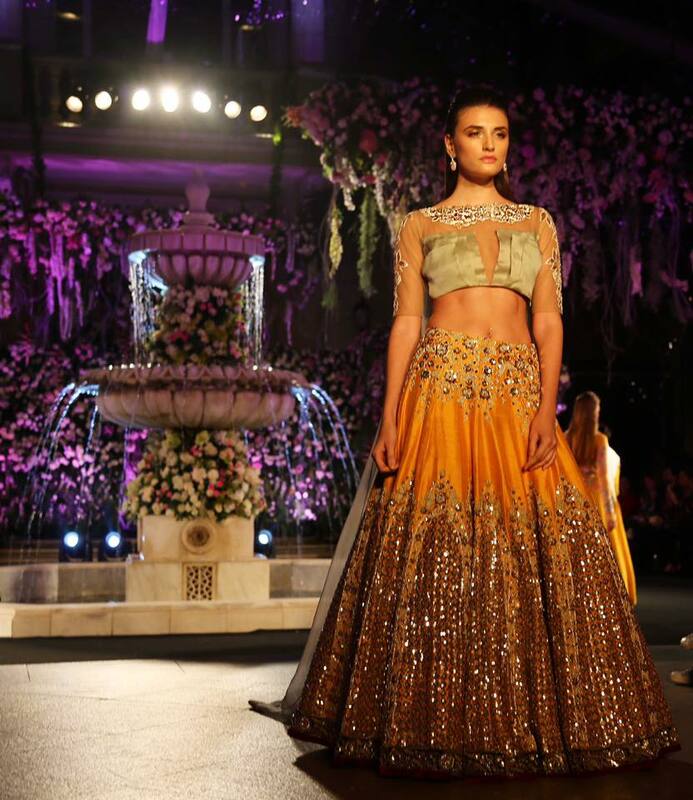 Drool away on these fifteen gorgeous Manish Malhotra’s festive collection lehengas! As the festivities approach, PYTs are busy decoding looks from the ramps, from Bollywood and from celebrities alike, because everyone wants to look smashing and fabulous this time. 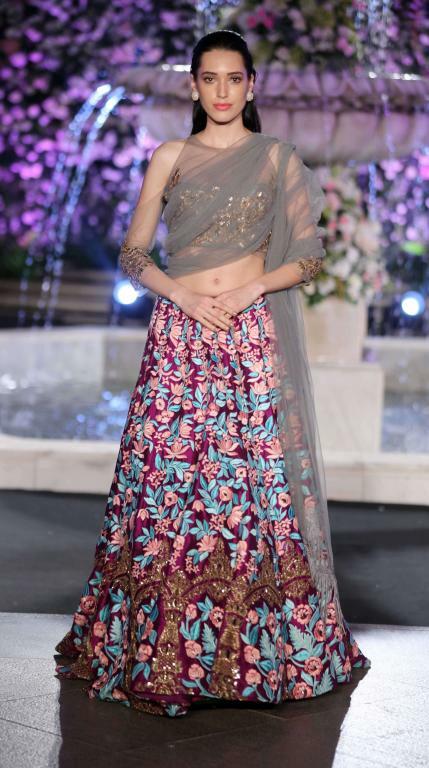 If you have been keeping a close watch on the festive collection being shown around, you wouldn’t have been unaware of what ace designer Manish Malhotra recently brought to the Indian lass- a range of Manish Malhotra’s latest festive collection lehengas to drool upon! However, if you’ve missed it all, here’s your chance to grab a look and decide which one to pick and wear! Take a look! Cutting off from the traditional ways of embroidery and appliqué, what we see here is a play of flora and fauna on a beautiful lehenga designed by the ace maestro. 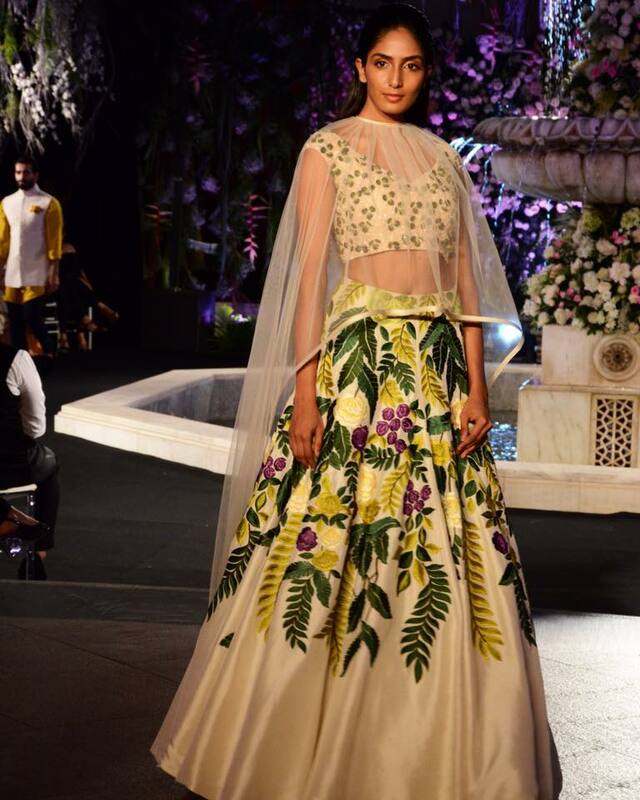 Large floral patterns and leaves adorn the body of the flowing skirt, with tiny leaves on the choli in ivory green. A play of warm tones for leaves especially with cool tones on the flowers in ivory, green and purple makes a magical effect quite unique. Graced with a netted odhni, the ensemble comes as complete and fashionable for the festive season ahead. Talk about festivities and the one metallic shade that is a must-have is gold. If not the whole ensemble, the designer has ensured a touch of Midas stays on his creations this time with pearls and gold details on the white base lehenga ensemble. Keeping the cropped choli very chic and chunky in gold buttis and touches, the flare of the skirt has been embellished with chunky pearly touches and golden flora and fauna weaves, creating a magical princess look for the evening parties to flaunt at. Mustard shades for the vibrant festival touch is a very resplendent note to rope in for the upcoming festivities, and when coupled with an oyster tulle neckline blouse, the duo creates magic. What we see here is the mustard flare skirt being the show stopper, with chunky golden touches on the flare of the skirt. The choli is in gold and oyster tulle that enhances the look, further accentuated with netted coverings bordered with golden embroidery. Unique as a combination and once again breaking away from the traditional touch, we see what the ace bridal designer has done here- he has played with shades of gray on a floral note this time. The odhni in gray net graces the model beautifully as she sashays down the ramp with a floral tulle skirt and a gold cropped sequinned choli. The flare of the skirt has been further accentuated with touches of gold embroidery, to add more oomph. Keeping in mind the femininity that needs to be flaunted with an oomph touch to his work, the designer has worked with golden thread-work embroidery on the flare of the handloom silk lehenga skirt in baby pinks. Throwing in a touch of silver flora and fauna in between on the flare is an eye catching statement, however, the showstopping effect is the off shoulder cape blouse in shimmery geometric printed grays. 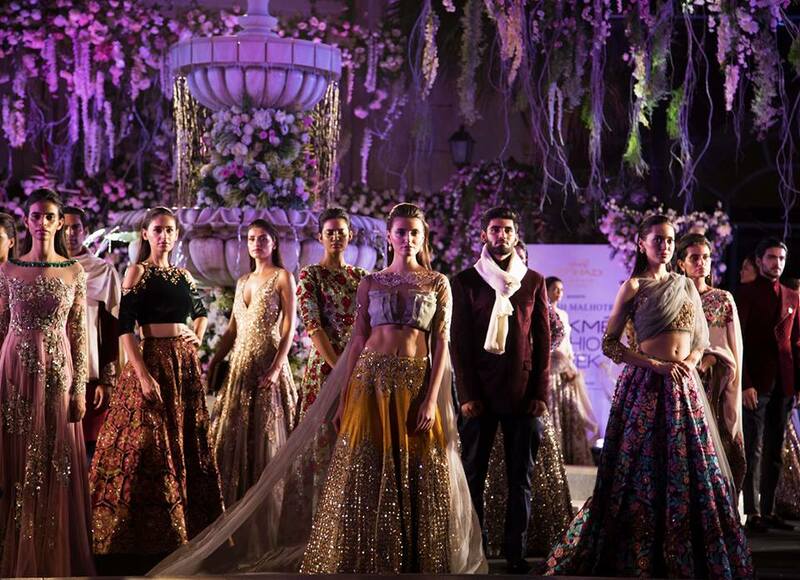 It seems the designer has had his mind made up to bring a touch of spring in autumn and winter this year, which is why once again we see the play of flora and fauna on the lehenga skirts. This time though we notice the play of large cool toned blue floral touches against the background of warm pinks on the lehenga skirt’s flare. The deep V neck shimmery gray choli is an eye catching statement, which can be paired with the lehenga skirt as shown for the evening gatherings.